Definition - What does Dandayamna Baddha Konasana mean? 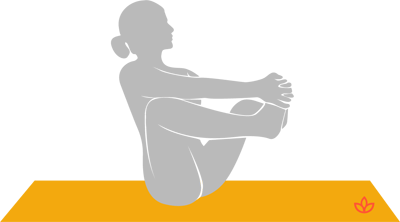 From baddha konasana – seated with the soles of the feet together and the knees dropped to either side – hold the outside of the feet and lift them off the ground, balancing evenly on the sit bones. In English, dandayamna baddha konasana is called balancing bound angle pose. In dandayamna baddha konasana, the feet are typically raised to heart level and the drishti is on the big toes. As a hip opener, the pose is believed to activate the svadisthana (sacral) chakra, which is associated with creativity, self-expression, reproduction and emotion. By balancing the energy of this chakra, the yogi unlocks emotions, increases sensual experiences, and promotes feelings of joy, pleasure and wellness. When svadisthana is open, the yogi feels free to express him/herself emotionally and creatively. In addition to its physical benefits, dandayamna baddha konasana improves mental focus and increases self-confidence.